Three hundred eighty one pages of recipes for dinner. 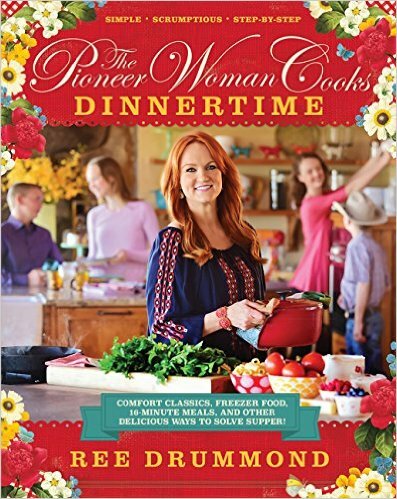 Ree Drummond, AKA The Pioneer Woman, does it again with her latest cookbook: The Pioneer Woman Cooks: Dinnertime — full of easy recipes for the home cook. I think that’s why I love Ree’s cookbooks so much — I can make anything in them and it’ll taste great. The first recipe I made from Dinnertime was one of her 16-minute meals, Beef with Snow Peas. I was skeptical because it required ginger, which I’ve never used. But something compelled me to spend $6 for a ginger root so I could make something different for dinner. We were in a dinner rut: tacos, pizza, steak, spaghetti, you know the drill. So, I made the beef recipe, with the expensive ginger, and it was amazing! The ginger gave it such a unique flavor that I felt we were eating Chinese take out in half the time it would take to order and have it delivered! The second recipe I made from the cookbook: Beef with Snow Peas! I said it’s a winner didn’t I? And, as always with Ree’s cookbooks, Dinnertime is filled with the step-by-step photos she’s known for. She includes some recipes that you can easily find on her website, but I have to admit that when I want one of her recipes I grab a cookbook. This book is perfect for the person who cooks dinner in your home (probably you!) or to give as a gift. Read my review of The Pioneer Woman’s other cookbooks, and check out her maple bacon scones from her last cookbook. Disclosure: Affiliate links are used in this post which means if you make a purchase we get a small commission, at no additional cost to you. I received a review copy of this book from the publisher. Opinions are my own.